It’s been almost a week since the Red Bull Ride My Wave surf contest visited Arugam Bay, Eastern Province, Sri Lanka and we’re all still trying to reconcile its impact. Many of us are hoping we can turn this experience into something that can in future strengthen the surfing community in Sri Lanka and help to put Sri Lankan surfers on the map. In order for this to be the case, we have to act together. In this beautiful, remote Sri Lankan sanctuary which is still remaking itself after years of civil war (ending officially in 2009) and which has suffered the devastating effects of the 2004 Indian Ocean tsunami, an event like the Ride My Wave competition (now in its second year) is widely anticipated by the talented local surfing community. It is the only opportunity they have to be noticed for their radical skills outside of their own watery playground. 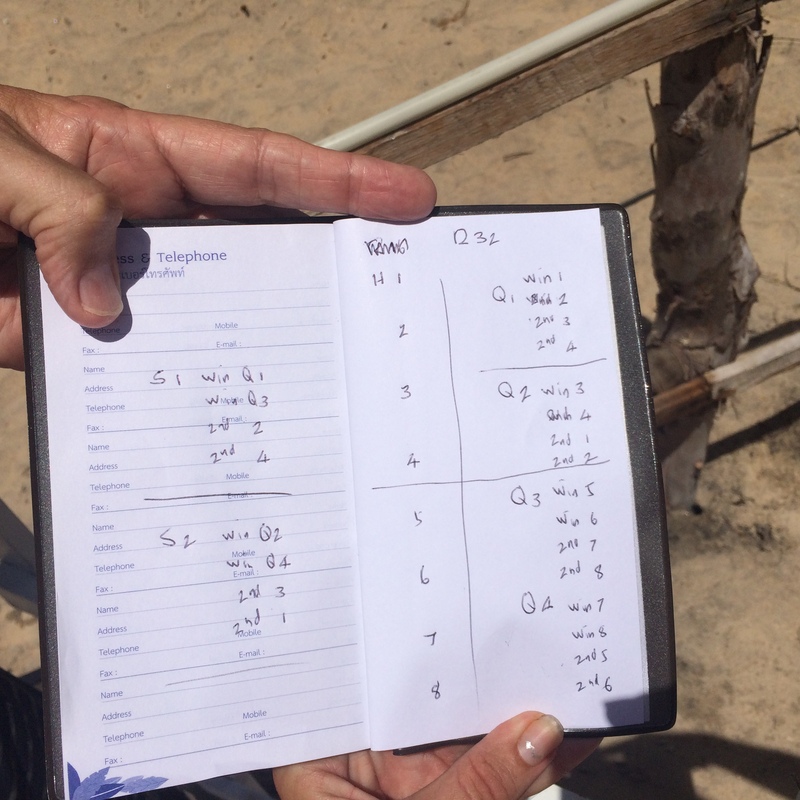 So, with a month or so to go before the competition, droves of surfers were visiting my small summer beach hut to get some assistance with registration – I have a computer and can write in English, not a common thing in the Arugam Bay village. By the time of the event, 64 surfers had registered to take part. There was a palpable sense of excitement by the day the event crew and panel of judges arrived in the Bay. “Yeeeeew!” we all wanted to say. 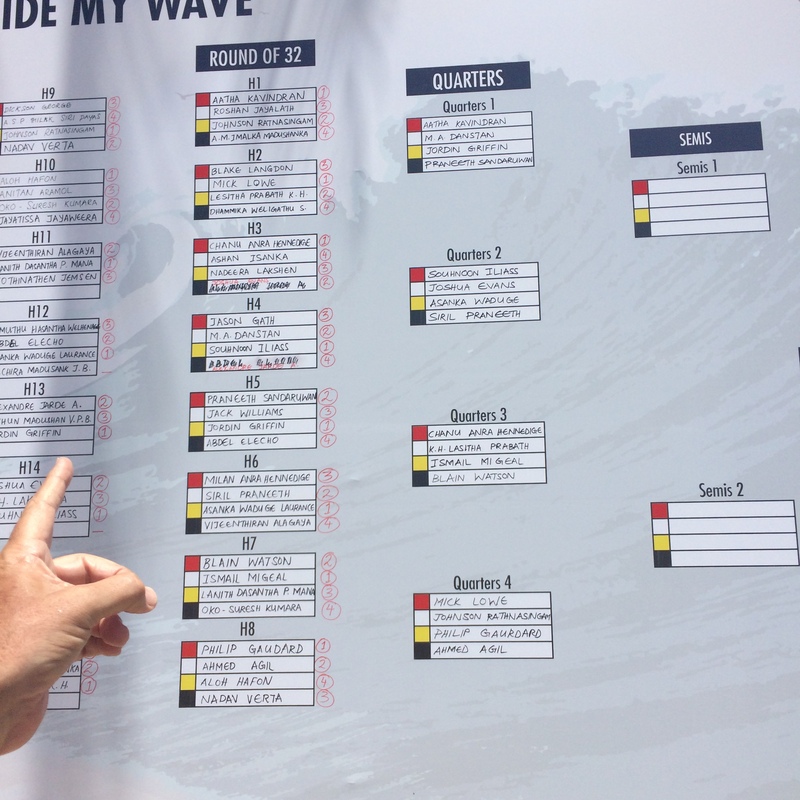 The first two days were super exciting, and several heats in particular were ones to watch – the surfers talented by any measure, highly focused, everything to gain from having next to nothing. Everyone was having fun and at that stage, there were only a couple of surprising eliminations, but that’s what can happen in a contest, right? By the end of the second day, something was looking very strange on the progression board. The same contestants were meeting again and again, in heat after heat. A number of us, non-experts, were confused and went to the judges and event team to ask why this was happening; from our knowledge of progression systems and the seeding in other kinds of sporting events, this kind of thing just shouldn’t be happening – it didn’t look fair. How is this happening? Sadly, I was too distressed to take a picture by the time the Semis were written up. The first time I asked what methodology the judges and event crew were using to cast the same people in the same heats over and again, I was simply told that this was the system and that was that. No further explanation. Luckily, a friend who was also spectating and happens to be an expert (he has been running international bodyboarding competitions for the last 15 years) couldn’t understand why the event organisers and judges were casting heats in the way they were either. He politely tried to give the panel and organisers a couple of other options which would help them to fairly distribute competitors through the remaining heats of the event. We all chilled out after the heats of the second day and if I’m honest, I kind of assumed they would see there was a simple mistake in their methodology and by morning would have amended the plan for the Quarters, Semis, and Finals on day three. I woke up on Saturday 25th July with a sense of foreboding, questioning the easy assumptions I had entertained the previous night. The Quarters took place, preserving the order arranged the day before. Nothing had been changed. Then the Semis were written up and the pattern continued. The same competitors together again. I went to the judges area to ask, again, why like this? I was not answered with much patience and was certainly being viewed as a nuisance by this point. One of the Red Bull representatives did take the time to tell me that as they are an international brand, they needed an international final, and in this way they were seeking to uplift Sri Lankan surfing (presumably by putting it on the map by having a range of nationalities place in the final…?). So, was it designed on purpose this way? Her comment suggested, yes, it must be… and indeed, the progression system was certainly going to guarantee an international final. And how exactly does this uplift Sri Lankan surfing? Still, if this was by design, why wasn’t this disclosed the day before, when we first questioned the judges and Red Bull crew? Or why wasn’t it disclosed to all participants up-front? As it hadn’t been, maybe it was still a genuine mistake… or something else I couldn’t understand and which wasn’t voiced…? Maybe the judges had a clear view of the talent before them and were taking a broader view of competitors – using their expertise in a way that none of the rest of us could understand? Confusion reigned and I found myself unable to watch the Semis, convinced by this stage I understood what the results would be anyway. So, when they were on, I took a shower to calm down and by the time I came back out to the beach, the results were being announced. My conviction was indeed right, I could have written those names onto the Final board myself. Maybe I should try the stock market. Perhaps I have a gift. Again, maybe not, it seemed no one was surprised. The only surprise (for everyone) came next (this, my friend Mary’s favourite moment of the whole competition): competitor Siril Praneeth (Locu to many of us, our gorgeous, talented friend), upon hearing the results from his Semi and his exclusion from the Final, roared (I mean ROARED, he is normally so softly spoken) at the judges a massive “f*#% you” – like the lion he is – and smashed his board on the fence. Too much emotion to contain. No one can judge this act, least of all Praneeth himself, as he struggled the rest of the day to come to terms with how he felt and what he realised had happened to him and other competitors in the event, on this their one chance to shine. You have just held the Red Bull Ride My Wave competition in Arugam Bay, Eastern Province, Sri Lanka. So many people look forward to, train, and work so hard to prepare for this event. I think it’s beyond question that the competitors and the spectators should expect a fair competition structure (and seeding), and fair and unbiased judging, all leading to a great event. I was very surprised to see some competitors compete against each other in the Heats, the Quarter Finals and the Semi Finals – three times! This happened to those in Heats 5 6 7 and 8. This was not the case with other competitors – those in Heats 1 2 3 and 4. I believe there must have been a mistake made in the allocation of competitors in the competition. Specifically those in Heats 5 6 7 and 8. The odds of this happening are so small that your fairness and openness comes into question. This, together with the fact there were only two judges sitting alongside the contest director, has caused a great deal of confusion and distress to these competitors. Kindly explain how and why this has happened, and if it’s an honest mistake, what steps you will be taking so that it doesn’t happen again. A clear and straightforward answer by 5pm, India Standard Time, on Thursday 30th July would be appreciated. No bull, Red or any other kind. Let’s see what happens… will report back when any formal response is made. The only feedback so far came from frightened members of the ABAY surfing community, frightened and asking me to delete the question I had posted… Frightened why? Within an hour of my posting, two of our friends in Arugam Bay had received calls from their contacts at Red Bull demanding the post be deleted, and no more questions asked of this kind, and threatening that if it wasn’t they would never be returning to Arugam Bay with their competition. Uplifting surfing in Sri Lanka? 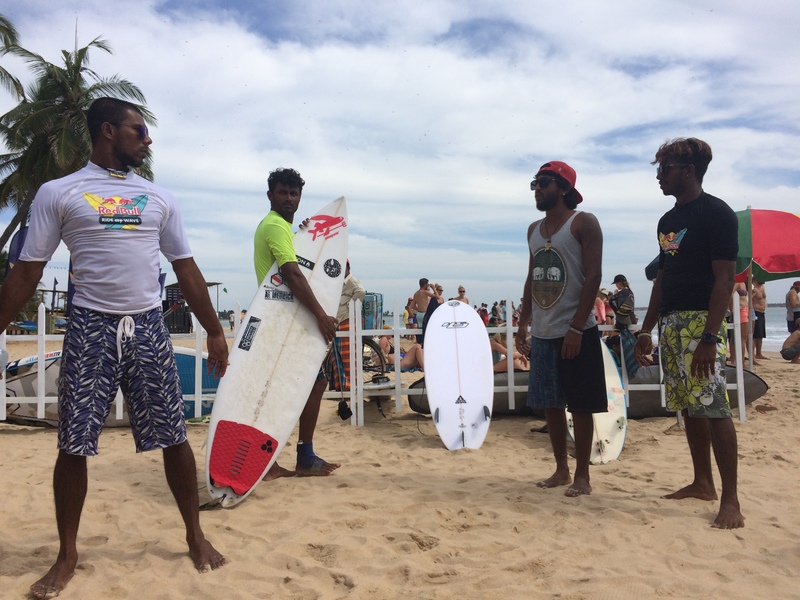 An international final to put Sri Lankan surfing on the map? One thing is clear to many of us – one of the most amazing responses the surfing community in Arugam Bay can choose in response to the stupefying events of the last week is to come together as a conscious collective and design their own future. It’s an opportunity to heal bonds perhaps still strained by the country’s recent history, choose which corporates they allow to come into their magical place, play a leading role in designing future events for their community, which serve their community. The Sri Lankan surfers can experience this and choose to keep putting themselves on the map. It’s a chance for talented individuals in the community (and there are many) to use their skills to play on the international stage, to appear in their own right as world-class surfers. I feel for you, Sri Lankan brothers and sisters. Red Bull needs you more than you need them. Don’t let that circus return. Complain to your politicians or whoever gave them the permit to hold the event. Don’t be intimidated by corporate douchbaggery. I’m certain many other real surf brands would support Sri Lankan surfing. Rip Curl, Quiksilver, Patagonia, etc. 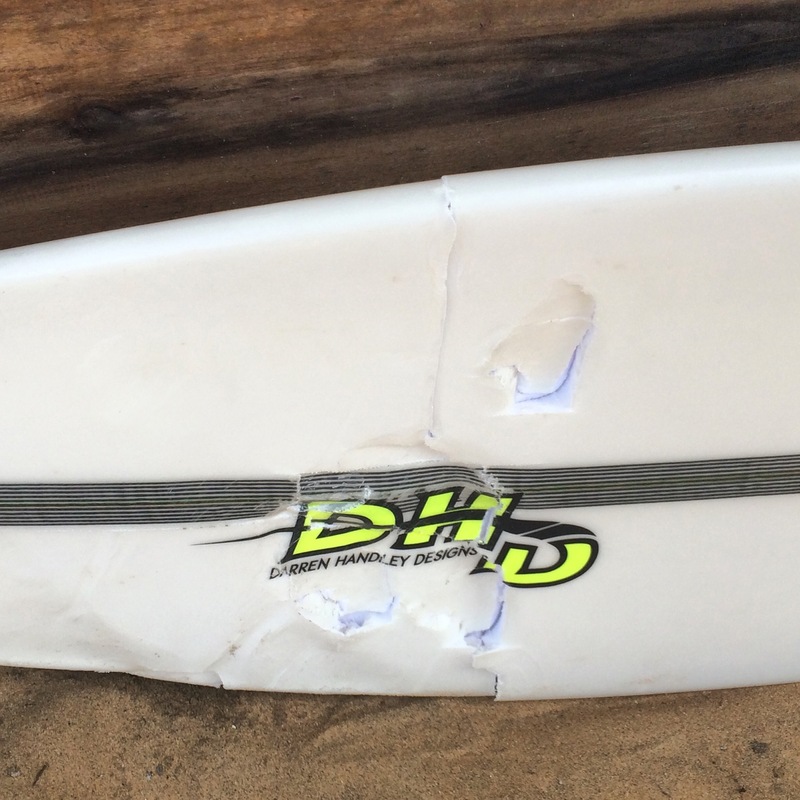 would be good companies to write leters to to help build the local Sri Lankan surf community. Red Bull isn’t even a surf company and their product is so unhealthy and dangerous for kids. Much aloha, Sri Lanka, from California! Thank you from all the Sri Lankan brothers and sisters for your comment and for those fantastic sentiments. You are completely right, no one on this earth should feel intimidated by anyone else, let alone a corporate intimidating a talented, strong, incredible community. Any sponsor is incredibly lucky to be entering the scene in Sri Lanka, especially at such a moment; post war and tsunami, communities across the nation are in a unique position to grow and evolve, and play a conscious role in that growth. Thank you for your support, Mike, and much aloha to California from Sri Lanka. Hello Debbie! I wanted to Express my deepest condolences to you and all the beautiful people of Sri Lanka. We are sickened and heartbroken by the evil acts of hatred which occurred on Easter morning. I pray that all of your loved ones are safe and that you continue to promote surfing in such a surfing paradise as Sri Lanka has become thanks to folks like you. May God bless you all with peace and great waves. Thank you so much, Mike, your sentiments are deeply appreciated. All of my loved ones, and so far as I know, all of theirs are safe and accounted for, thank you so much for asking. The purity, joy, and beauty of the ocean pulses on stronger than ever and my friends in Arugam Bay continue to look forward to a fantastic surfing season in the coming months, although they realise the Easter Sunday bombings will impact visitor numbers. Stay safe and strong, and thank you for your words, Mike Thompson.